You are going to Watch Naruto Shippuden Episode 354 English subbed online free episodes with HQ / high quality. 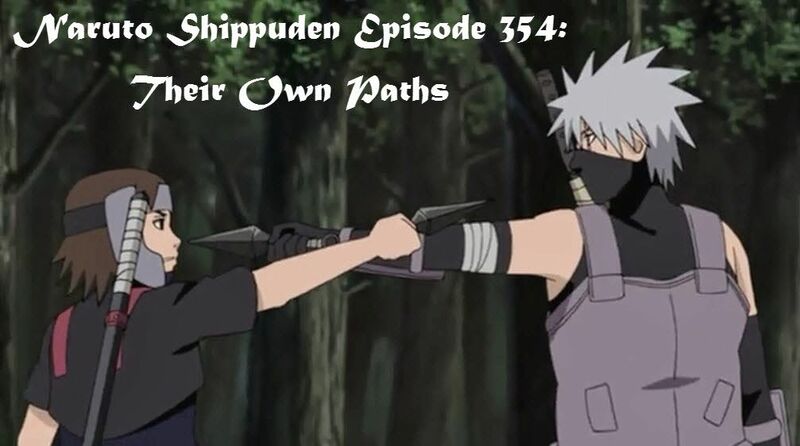 Stream Anime Naruto Shippuden Episode 354 Online English sub Their Own Paths. With Kakashi catching up to them, an adamant Kinoe refuses to surrender Yukimi to him. But remembering the things that Orochimaru had did for her clan, Yukimi opts to return to her home to stop the fighting between the two ANBU. But once back at her home, Yukimi finds several of her kinsmen killed by Orochimaru’s hand. Fleeing from him, Orochimaru chases Yukimi with Kakashi and Kinoe arriving at the hideout shortly after. Unable to find Yukimi, they are guided by the smoke trails of the departed clan members and they are able to drive off Orochimaru. Apparently too late though, Yukimi begins to turn into smoke and in an attempt to save her, Kinoe tries to use his Wood Style to encase the smoke. Then, the smoke trails of the clan members gather around Yukimi, changing the artificial encasement into an actual tree that a stable Yukimi emerges from. Ultimately all three decide to walk their own paths, with Kakashi informing Kinoe that they neither saw Orochimaru nor discovered the Iburi Clan.